I spent about four hours cutting my grandparents lawn yesterday. I made the executive decision to take my shirt off to avoid any sort of hillbilly tan like the dude above. 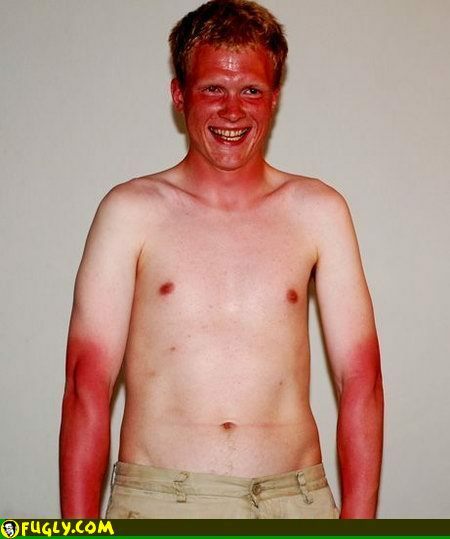 I didn't have any sunblock to protect my pale skin from the dangerous UV rays. It was a nice sunny day out. And the sun was a shining. For some reason I thought the task would only take an hour or so, but after about the three hour mark I just accepted the fact that I was going to be hurtin' later. I could tell by the pink forearms that I was going to be burnt pretty bad. 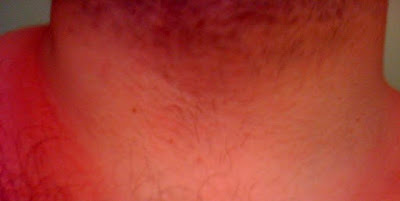 While I was cutting the last strip of grass, I thought to myself how bad my shoulders were burned. 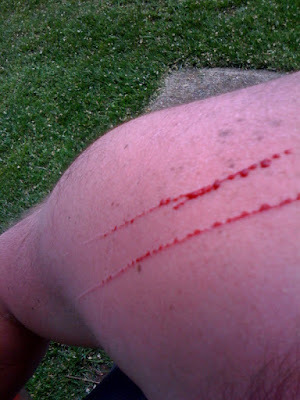 I thought, "Jeez, it can't get any worse than this..." and at that exact moment I drove under a tree with a bunch of thorns hanging off of it and did this to my shoulder. So basically my whole body is pink. 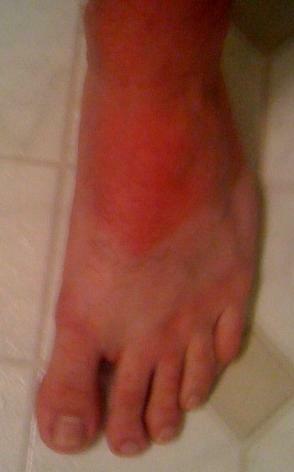 Not even my feet were spared from the sun. Check out the sweet sandal tan line. Aloe is now my best friend and only hope for making it through the week. Basic activities have to be well-thought out so that there isn't any moving that would cause my skin to come into contact with anything. Sleeping is a nightmare. Dogs running across my chest and clawing my arms and shoulders is not a good feeling. Taking a shower feels like broken glass is coming out of the faucet. Damnit Kyle. God damnit.